And the Persian for “Naples” is? Last week I read the most fascinating book I’ve read in ages. If I go on to say that this book compares the fragmentary remains of an ancient Greek novel with the fragments of a medieval Persian epic poem, this may well be the moment you and I part company, dear reader. And if you do abandon this blog and find something more interesting to do, I quite understand. It came as a surprise to me too. But why did I find it so interesting? The Greek text is a few pages of a novel, maybe written in the first century BC, entitled Parthenope or Metiokhos kai Parthenope (“Metiokhos and Parthenope”), while the rather longer fragment of Persian poetry is a chunk of the Vamiq u ‘Adhra (The Ardent Lover and the Virgin), written by the poet ‘Unsuri in Ghazni, now Afghanistan, in the eleventh century AD. By chance, the very small parts of each work that survive overlap, and it’s perfectly clear that the Persian poem is an imitation of the Greek novel. The link or links between the two texts must be pretty close: there may have been an Arabic intermediary version of the Greek novel that ‘Unsuri turned into Persian verse, but it’s also possible that the “translation” from Greek to Persian was direct–that ‘Unsuri or a collaborator read Greek, in other words. It all makes for quite a disorienting reading experience. In this Afghan poem, written a generation or so before the Norman Conquest, we find ourselves reading about ‘Adhra’s father Fuluqrat (Polykrates), tyrant of Shamus (Samos), with his court poet Ifiqus (Ibykos: “In Iran and Rum and Hindustan/ They told good things about him”). Meanwhile Vamiq recounts the story of Hurmuz (Hermes) discovering for the first time how a tortoise shell can be made into a lyre, and compares himself to Landrus (Leander) in his passionate devotion, and ‘Adhra to Haru (Hero) in her beauty. The plots, or rather the plot, of the novel and poem is the classic plot of an ancient novel: beautiful boy and beautiful girl meet, instantly fall in love, are separated by misfortune, and the girl maintains her virginity (‘adhra is Arabic for “virgin”; and parthen- also means “virgin” in Greek) despite numerous mishaps and enforced journeys with pirates and slave-traders far and wide. Among other places, ‘Unsuri’s poem seems to have taken ‘Adhra and the reader to Righiyun (Rhegion) in the south of Italy, and possibly Tarentum (Tartaniyush). Naples may have marked the limit of Parthenope’s travels to the West. Presumably at the end of the story boy and girl were reunited and lived happily ever after, but we’ve no clear evidence for that. For a Classicist, at least, it’s pretty stunning to find a classical Greek text exerting that kind of influence way to the east in the borderlands of India, a millennium after it was composed. ‘Unsuri was a court poet of Mahmud of Ghazni, and that court, enriched by Mahmud’s military incursions into India, was a major cultural centre. This was where the great polymath al-Biruni was based for the last decades of his life, and also where the national epic of the Persian people, Firdausi’s Shahnama, “The Book of Kings”, was composed. In al-Biruni’s case, we know that his writing was greatly influenced by Greek thinking: al-Biruni is a remarkable figure, simultaneously the author of the first great study of India, and a mind deeply versed in Aristotle, although very prepared to disagree with the Greek master. He may also have had some kind of working relationship with ‘Unsuri, since they shared some topics in common (both wrote about the Buddhas of Bamiyan, for example, and both about Vamiq and ‘Adhra). Nevertheless, the notion that Greek literature, as opposed to philosophy, science or mathematics, could find such a positive reception on the eastern fringes of Islamic world is something else. This Classicist has a couple more reasons to be interested in ‘Unsuri’s poem, all of them related to my personal obsession with Bamiyan. The first is just a tantalising possibility. The text of Vamiq u ‘Adhra was discovered by the Pakistani scholar Mohammad Shafi in around 1950, reused as stiffening in the binding of an old Arabic theological handbook. A note found along with the leaves of poetry seems to be an inventory of books belonging to a man named Zaki b. Muhammad b. ‘Ali ‘Abd ul-Hamid al-Bamiyani, and the al-Bamiyani at the end of this man’s impressive name may suggest that the library where this copy of Vamiq u ‘Adhra originated was at Bamiyan. The manuscript itself dates to the twelfth century, and at that time Bamiyan was a thriving and important city, as indeed it was right up to its destruction by Genghis Khan in 1221. An origin in Bamiyan for the manuscript is an appealing possibility, but a less tenuous connection is that ‘Unsuri, author of Vamiq u ‘Adhra, wrote another poem entitled Khing but u Surkh but (The Moon-white idol and the Red idol), another romantic tale, also lost, which offered an explanation of the great Buddha statues at Bamiyan, celebrated marvels in the medieval Islamic world: Khing but, “Moon-white idol” and Surkh but, “Red idol” were the established names in Islamic accounts for the smaller and larger Buddha at Bamiyan. ‘Unsuri’s poem on the Buddhas shared the same metrical and rhyming system with his Vamiq u ‘Adhra, an epic system also used for romances, and in fact it’s often unclear which fragments belong to Vamiq u ‘Adhra and which to Khing but u Surkh but. But we know that the latter poem described how two lovers were separated and died apart, but were buried together, their tombs being the two gigantic Buddha statues. In my book on Bamiyan I used the fact that ‘Unsuri wrote a poem about them to illustrate how diverse Muslim attitudes to the giant Buddhas have historically been. To listen to the Taliban you would think that, as religious images, they were an obvious affront to Islam. But the fact is that they survived for well over a thousand years in an Islamic culture, treated (as I’ve mentioned) as wonders of the God-created world. Here in ‘Unsuri’s poem they were the romantic leads. This brings us round to what I think is the most important thing that Vamiq u ‘Adhra has to tell us about Bamiyan. I’ve described ‘Unsuri’s patron, Mahmud of Ghazni, as a great patron of the arts. This was the case in literature and natural science, and also in the visual arts: for example, beautifully decorated Ghaznavid palaces once lined the river Helmand near Lashkar Gah (the Ghaznavids’ winter capital), a place with entirely different associations today. But it’s fair to say that isn’t how Mahmud’s seen in all quarters. Take for example Mullah Omar, spiritual head of the Taliban, who repeatedly in the run-up to the destruction of the Buddhas of Bamiyan in 2001 cited Mahmud of Ghazni as a precedent for his own policy. A story, and it is just a story, is told of Mahmud’s plundering of the Hindu temple at Somnath on the coast of Gujarat: the priests in the temple, so we’re told, tried to buy back their idol, a Shiva linga, from Mahmud, to which he is supposed to have responded, “I am the idol-breaker (but-shekan), not the idol-seller (but-furosh).” According to the folktale Mahmud is the perfect Islamic warrior, undistracted from pious idol destruction by the seduction of money. In 2001, when foreign organisations offered to pay Afghanistan to preserve the Buddhas, Mullah Omar responded with Mahmud’s (alleged) words, and of course proceeded to break the idols of Bamiyan. But the truth about Mahmud is there, if we look hard enough, in the Vamiq u ‘Adhra. Far from being driven by religious zealotry, Mahmud was motivated by the human and practical demands of an impressive court, a professional army and expansive ambitions: he needed money, and the wealthy temples of India were good sources of it. Cash was his motivation for invading India, not the saving of souls. Now Mahmud no doubt dressed up his activities as the actions of a pious Muslim bringing enlightenment to idol-worshipping Indians. But in actual fact the position of the Ghaznavid empire in the borderlands between the world of Islam and India required a ruler in his perilous position to be very liberal, for the day, in the relations he maintained with other faiths. For example, there was an Indian quarter in Ghazni, home to Indian contingents which formed an important part of Mahmud’s invading forces. We even hear of the widows of Mahmud’s fallen Indian soldiers committing sati, an entirely unIslamic practice. In the Vamiq u ‘Adhra Mahmud, or maybe his successor Ma’sud, enjoyed a Greek popular story of a couple that met in the famous haikal or but-khana, temple, of Hera on Samos, one of them an assertive young woman who holds her own in philosophical debate on the nature of Love in the company of men, and later fights in battle. Literature is not life in any straightforward way, of course, but it’s equally clear that the notion of Mahmud as a model of puritanical zealotry can’t survive the sophisticated and gloriously polychromatic environment of his court at Ghazni, or the pleasure palaces beside the Helmand. For all the sophistication, life in eleventh-century Afghanistan was insecure. In the two centuries after the career of ‘Unsuri (who died in 1039/40) Ghazni would be sacked twice, by a Ghurid leader known for his treatment of Ghazni as Jahan-suz, “The World-burner”, and then with even greater destructive force by Genghis Khan. Bamiyan, too, would be destroyed by the Mongols: the traveller ibn-Battuta tells us that “Genghis massacred the inhabitants of Bamiyan, and destroyed it from top to bottom, with the exception of the minaret of its Friday Mosque.” It’s not too surprising that ‘Unsuri’s poem on Vamiq and ‘Adhra all-but disappeared. I’m deeply grateful to Jean-Marie Lafont, another Classicist who has strayed into Central Asia, for drawing my attention to this remarkable literary phenomenon. 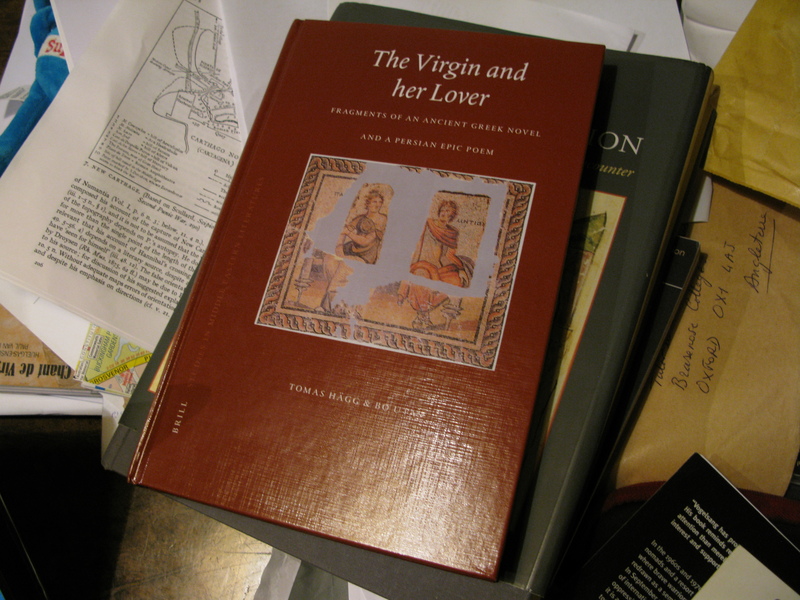 The book I’ve been reading is by Bo Utas and the late Tomas Hägg, The Virgin and her Lover: Fragments of an Ancient Greek Novel (Leiden, 2003).